I love making this cake, simple reason that it is not difficult to make. 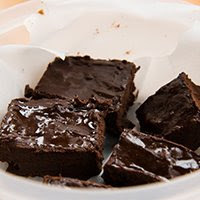 You just dump all the ingridients in a big bowl , give it a good mix , pour it to the cake tin and , there is a delicious cake ater a hour or so. I love the frosting also and i was in a palyfull mood so i just added a bit food colour to the frosting. This is a recipe from one of my favourite cake book. 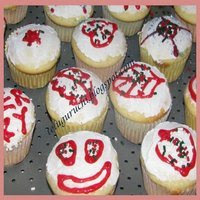 It is full of easy cake and dessert recipes. 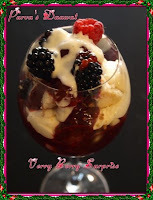 It is a Australian Women's Weekley Cookbook called Sweet Old-fashoined Favourites. 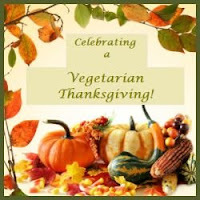 I have made a lot of recipes from theis book and each time it was real good. 2 cups mashed overripe bananas. Sift flour sugar, cinamon, baking soda into a large bowl. Stir in eggs , oil, nuts, banana and pineapple, stir intill just combined. Pour the mixture into the prepared cake tin, bakein moderate oven about 1 hour. Stand the cake 10 minutes before turning onto wire rack to cool. Spread the cold cake with the cream cheese frosting. Beat everything in a bowl, with electric mixer untill light and fluffy. I am sending this to DK's deadline is by Nov: 30th. So if you have forgotten to send her, do hurry up. Here at home we have bread twice a day. For breakfast and for evening dinner. I remember after getting married and comming here to live, and saw everybody eating bread for breakfast and for dinner, except on weekends, then we have bread in the afternoon and i make a cosy dinner so that we can open up a bottle of wine with the food. So seeing here bread , I was like WHAT at home back in India we only ate bread when we were sick. I am talking about when i was at home, which was years, years, years a,d years ago. Now the eating habbits have changed there also. Really the time when we had bread at home was when we were sick. You should know that in India we always have warm food for breakfast, lunch and dinner. So when I rang home and told everybody that I am eating bread twice a day they were really sorry for me. But I got used to it and I enjoy my different variety of bread. Especially if i make them at home. Which I mostly do. Unless if it is holidays for my daughter, then I have no time to make bread as one is busy doing other things. Have to admitt nothing beats home made bread. 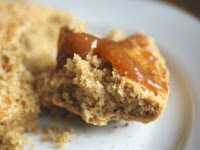 When I make bread I always use spelt flour , more informations here. If I use normal bread flour it is difficult for digestion for hubby dear, so years ago we changed to spelt flour . The main reason I started making bread at home was this, as spelt bread was really difficult to get from the bakers and also very expensive. So making them at home was the solution if we wanted to have them. Now i think it is available everywere. 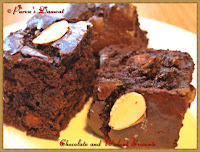 Priay of Priya's Easy N Tasty Recipes tagged me to bake a bread for The Worldwide Blogger Bake off Challenge. In my draft these bread have been there fro months, i had taken the pictures when i was making round and long shaped bread, so thought I will post them both for this good cause. Breadline Africa is a South African-based charity that is seeking to put a lasting end to poverty South Africa (and further afield in Africa) by breaking the cycle of poverty and helping communities to achieve long-term self-sustainability. Breadline Africa was founded in 1993 when a group of community and social workers in South Africa (who had first-hand knowledge of the uniquely African problems that they faced) formed an alliance with like-minded colleagues in Europe (who were well-placed to source donations in valuable foreign currency). Armed with this unique combination of skills, Breadline Africa has been able to raise funds in Europe and use their local knowledge to identify which small, ground-level projects in Africa are most likely to succeed with a financial boost. On Blog Action Day, Breadline Africa launched their Worldwide Blogger Bake-Off Campaign.. The aim is to raise $1 million in funds for a project to convert shipping containers into locations for food production and distribution in Africa. It is hoped that these sustainable community kitchens will not only provide food such as bread and soup to those in need, but also opportunities for skills development within poor communities. Bloggers can download the Blogger Bake off Widget n tag five other bloggers to do this challenging bake off..
Sending this to YeastSpotting. You should all do for a visit to Wild Yeast, there is such a huge variety of bread there. Now here is the recipe for splet bread. I buy my splet flour from a farmers oraganosation shop. The recipe is written in their bags and I have been using this recipie from the start. Mix all the ingridients and mix for 10 minutes untill you have a soft ball. Put the dough in a bowl and cover with the cling film and keep in a warm place for 1 hour or untill it has doubled up. Preeat the oven to 200°c and bake for 50 minutes. To check if the bread is baked you just have to knovh with you knuckle , it should sound hollow. If you have a bread machine look to the instruction in the book and make them. I have been blogging now for more than a year and till now have not hosted any events here. So I thought it was about time I did one. It is not a monthly one, it is just for the holiday season.Actually the reason I thought of doing this event was because I got a comment from Shankari of Stream of Consciouness , she commented on one of my post if I was going to do edible christmas gifts this year too like the teas bag I did last year. And I was saying to myself I would love to blog about the home made christmas gift I am doing and send for a event, but there is no event to send for, so then why not do it myself. If you want to have ideas , just go and check Zlamushka's spicy kitchen for wonderful ideas from last year. She is the reason why I made the spicy tea mixture last year. 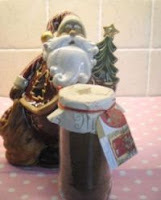 Any thing edible or which you can used for your cookingAnd it is christmas so why not bottle it up, wrap them up give it a holiday feeling. 6. A picture 200X200 pixel, it doesn't matter if it is not the exact size, i have noticed I can never have them in the exact size when ever I try to resize them. 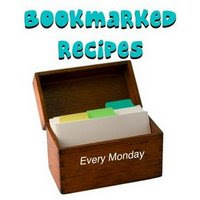 When you write a post, link to this page and to the round up link, so everybody can see them if they want to have ideas for their home made gift. The event deadline is 20th December.I am not doing a round up. Don't be SHY to send more than one. You may send as many as possible. If you like use the logo too. Instead of round up I will post here, from the time I start getting entries so, everybody who is intrested in giving homemade christmas gifts will get ideas from now itself and they can strat making them too. Labels: Home Made Christmas Gifts. 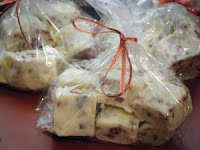 Send these Candy Cane Cookies, Snowflake Cookies and Nutty Chocolate Fudge in those packets there is three variety of cookies, they are Nutty fudge bars, Candy Can cokies, Snowflake cookies she made them for her daughter friends, I do wish i was one of her daughters friend, then i would get them too. 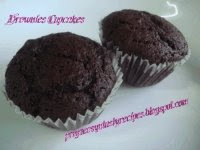 Send these Gingerbread Muffins they are a favourite in her house and with friends. 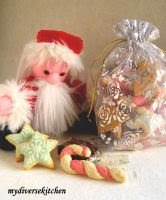 She often make a batch to put in Christmas hampers. 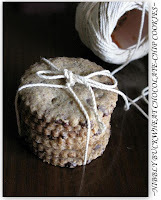 Send this OATMEAL COOKIES IN A JIFFY i am sure all of us will agree this is a wonderful way to make cookies, why? simple you don't have to bake them. Send these Pop in Pakodas, She loves her moms pakodas but she had to make herself these as yeah she is married and living aways from mom. If you want to know shortcuts to make bronies just hope over to her place. Send this Delicious Fleu de sel macroons don't they just look gorgeous. Wish I had the courage to make these beautiful and delcious macroons. Well i can just sit here and drool. 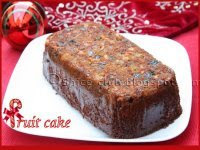 Send these delicious Christmas Cake thise dry fruits inside the cake looks like precious stones. Send this Nibbly Buckwheat Chocolate-chip Cookies I can imagine nibbling to these delicious and beautiful cookies, she didn't know buchwheat was available untill recently, apprently it is widley available in Indian in the name of 'kuttu ka aata', good that she discovered so we could have these delcious cookies. 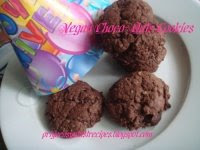 Send these Vegan choco - oats cookies, I am sure all of us will be delighted to see on any party tables as we can have double portions. 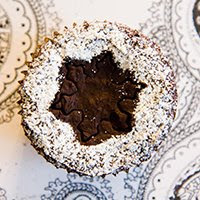 Send this Peanut Butter Truffels, while making them shae had more than one and while she was rolling them in the crushed peanuts she really had to remind herself that it is midnight and she won't be able to sleep if she is on a chocolate high. I am sure even i would do the same. Bee & Jai of Jugalbandi from North Western U.S. Send this Lavender oil Bee wanted to capture and preserve the aroma of lavender, just as Bri had captured the essence of roses in her Ecastatic Organic Rose Vanolaa icecream. 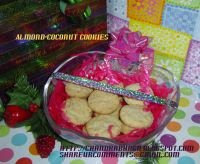 Send this Almond Coconut cookies, she says these cookies make a special treat. Not just for the holidays , baking them is so easy that you just have to mix up the ingredients, bake'em and have it ... whenever you like. 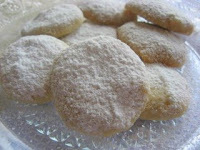 Send this Mexican wedding cookies she sayw they were real melt-in-the-mouth, perfect with a cup of hot tea. Looking to those snowy cookies I am certain they were indeed melt in the mouth. send this Italian Pepper Biscuits these are the cookies made by her dad as her mom prefers when her dad does because he twists each cookie so uniformly. Seeing them I totally agree with her mom they all look perfect size. Send this beautiful Christmad Stocking cake, for her baking is absolute passion, her husband is convinced she suffer from withdrawl symptoms if she let a week go by without baking. From this beautiful cake i would say indeed she must be baking a lot to come up with something so beautiful and delicious. Send this Red Velvet Cake doesn't that slice a real beauty, looks so inviting and so festive. The colour of the cake just amazed her. Send this cute looking Cherry Blossoms can you imagine there is only 60gm of butter in it, I am sure going to make this. 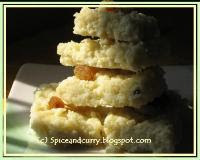 Viji says they just melt in your mouth cookies, the thought itself makes me want to make them. 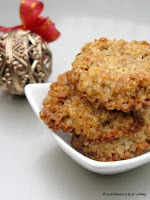 Send this Low fat Almond and Oats Cookie - Eggless, she found this recipe when she was throwing away a plastic bag which previously contatined oat flour. Are we gald that she found it as now all of us can enjoy this healthy delicious cookie. 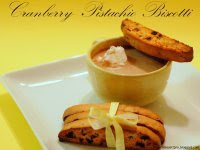 Send this super delcious looking Cranberry-Pistachio Biscottis according to her these are lil cuties. And I totally agree with her. JZ gave us a hint how to enjoy these cuties. Send this yummy kalakand wish i had few of those, her MIL was so full of praise for her kalakand and i am sure that says itself what a delicious kalakand it is. Send this delicious looking Chocolate Chip Cookies bundle, She almost given up making cookies thinking they don't like her as it was always didn't turn out perfect, am I happy that she didn't give up, otherwise i would not have got these delicious cookies. Send this cute little Thumbprint cookies she is overjoyed that these cookies turned out to be so perfect as the last time she made them, they were not. I myself am ovejoyed , that she send me this perfect cute and delcious looking cookies. Send this ( I grabbed them, how can you resist not to :-)) Delicious Cranberry Jam she has mentioned in her place, this jam recipe the cranberry fruit does it all for you, due to its pectin-intensity, that it sets to jam once the berries have burst. 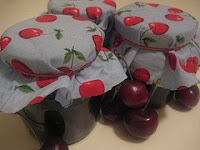 I love this jam on toast or warm, buttery croissants or you could use it as a filling for Cranberry muffins/cupcakes. Using for the muffin filling, yeah that is indeed clever. Send this Christmas Fruit cake , doesn't it look super moist , I love this cake as it only took 45 minutes to bake. 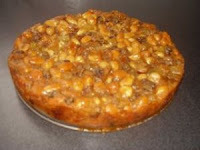 I have not made my christmas cake till now, I think I am going to make this as it only takes 45 minutes. 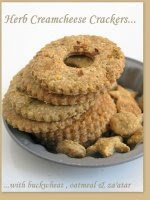 Send this nutty delicious & healty Oat Walnut Wafers, the cookboof from whcih she got this recipie is Australian Heritage Cookbook and she knows it from page to page as she was reading them when her daughter was sick and she had to stay in. 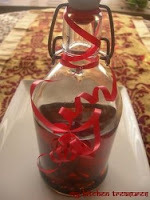 Send this "drumroll" Home made Vanilla Essence. 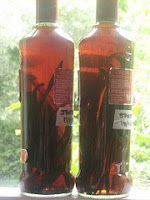 And she siad , it is REALLY simple to make ( i totally agree mine is in the drak corner in a shelf), you just split some vanilla beans and throw them in a bottle of vodka... leave it to brew for a few months in a coold, dark place and you have vanilla essence - a massive bottle of it! 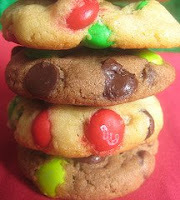 She send this Christmas M&M Chocolate Chip Cookies, She used christmas M&M, What i like about this was, she made a bunch and then freezed the rest in balls so that she can make them later , so that she get the feeling christams last longer, now isn't that a wonderful idea. 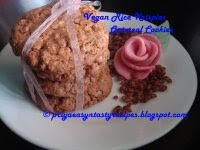 Send this Vegan Rice Krispies Oatmeal Cookies which is made from with canola oil n applesauce and they are very very crispy, tasty n healthy. 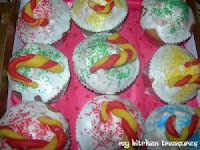 I loved making these delcicious Christmas cupcakes, with marzipan cane and having fun with all the colours. I think I should keep a box with me so when ever I feel a bit down, i just have to look to these colourfull cupcakes and I am sure I will feel colourfull myself. Sebd this Apple Date and Raisin Chutney. Katie says ,This is a lovely winter chutney, sweet and fruity but with a gentle warming glow from chilies and fresh ginger. It’s the perfect accompaniment to cheese and some good crusty bread but would work equally well with ham or a wedge of pork pie. You know ladies she has 4 jars of these cooling on then counter, woudn't we all love to have one. Send this Delicious looking Golden Panforte. Send this delicious healthy Oatmeal chocolate pistachio cookies she send these delicious cookies to her friends in Crete. And if i say a whole bunch, I mean a whole bunch. You should check out her place she was baking these cookies like nothing to send for them. Wouldn't we all love to have a box of these delicious cookies. 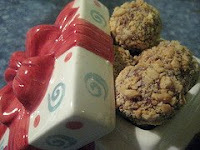 Here's a fun, easy gift from the kitchen. I've made these for teacher gifts and used them in various gift containers. 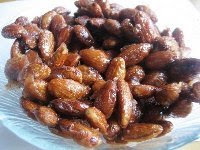 They are nice because they can add some height if you are doing an assortment of goodies in a basket or other container. 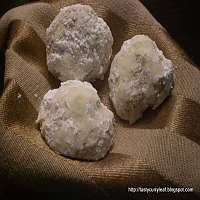 Send this yummy Hazelnut Snowballs, she says simple and easy cookies made with hazelnuts and rolled in powdered or confectioners sugar.Hazelnuts or Cob Nuts , it mightbe simple ,but it sure looks delicious to me and. 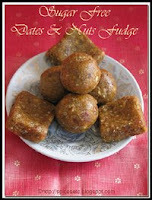 She send this delicious Almond and date balls, they are llow in fat and low in sugar, a delight to have something light, especially during the holiday season. 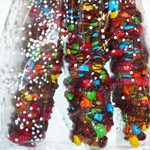 You would be surprised how easy these are to make. 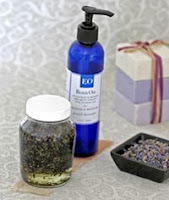 Homemade gifts are a wonderful, thoughtful gift to give to family or friends at Christmas time. They are exclusively made for the person receiving the gift(s) and add that little extra treat of luxury you maybe unable to find in shop brought gifts. Anyone can buy a present from a shop, but if you want to go the extra mile, why not make something yourself? Homemade gifts make really thoughtful and often better value presents. I do agree with her, who woudn't want to have this cranberry -studded mince meat if i had them i would certanly make delicious mince pies from them. Looks at these Christmas Spiced salt, don't those puink red pepers and chilies look like tiny emeralds. She send this Cranberry and Apple Chutney woiudn't you love to have them too especially with you cheese sandwitches or cold meat.